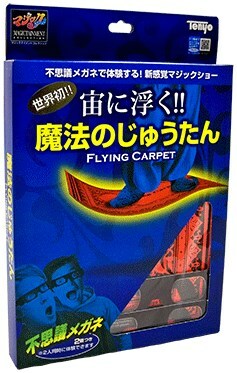 You make the Flying Carpet float in mid-air, approximately 4 inches above the floor! There is absolutely nothing between the base and the Flying Carpet. Next, you actually step onto the Flying Carpet! While still standing on the Flying Carpet, you bend down to move the base forward and backward, left and right. There is clearly no connection. At this point, your spectator will likely shout out, "Impossible!" It is uncanny how amazing your spectator's experience of this illusion appears.